“The problem is that I can’t escape my mind,” I said. “It’s inescapable.” Set in Indianapolis, Indiana, Turtles All the Way Down tells the story of Aza Holmes, a girl who suffers from multiple anxiety disorder and OCD. Aza often describes her mind as a prison, and throughout this novel, her anxiety causes many problems for her, and tends to control her every action. Daisy Ramirez, Aza’s best friend, who writes Star Wars fan fiction, also plays an important role in Aza’s story. After stumbling across a new story about the sudden disappearance of billionaire Russell Pickett who vanished among fraud allegations, Aza and Daisy set out to discover what really happened to Russell, and to claim the $100,000 reward money. Through their detective work, Aza becomes close with David Pickett, son of Russell and one of her old childhood friends. However, due to her anxiety disorders, which often manifest as a fear of the human microbiome, Aza finds it difficult to pursue a relationship with him. Over the course of this story we see Aza get out of her comfort zones and not let her OCD and fears control the way she lives her life. 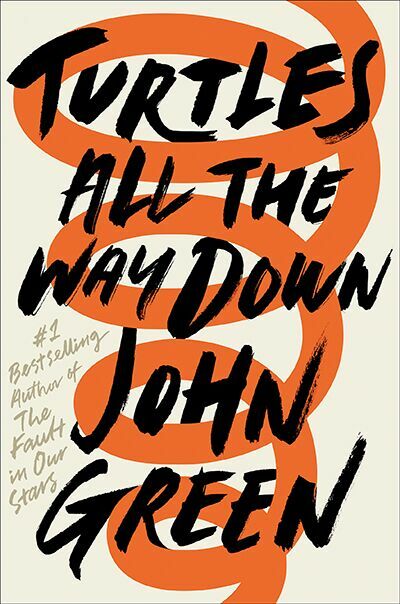 Turtles All the Way Down is a heartwarming story, and one I will be definitely be reading again sometime soon. My favourite character is Aza because besides being a thoughtful and interesting person, she is the first character I have read about who has had mental health issues. As someone who has anxiety, I really felt connected with Aza, and it was nice for me to finally find a character who worries about similar things. I really enjoyed reading this book because it was well written, had relatable characters, and a plot that kept me engaged throughout the entire story. Review by Anya, age 16, grade 11.